Tracy Holmes’ BreakThrough Colour (BTC) Kickstarter campaign has blown past its original goal and proved that polymer artists are hungry for better color control. Backers quickly pledged over $32,000 to get first crack at the printed version of this useful and practical system that’s aimed to appeal to both sides of your brain. A full spectrum 216-card color deck helps you choose your palette and then coded numbers assure accurate color mixing. The BTC Colour Basics cube shown above is the simpler 3x3x3 color model that Tracy used for her article in The Polymer Arts magazine. 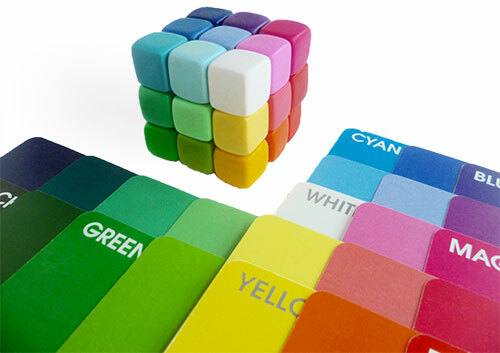 The BTC Mini Cube below shows 152 hues, tints, and shades on the outside plus 64 tones on the inside. Tracy says that the first print run will fulfill the pre-orders that come from the Kickstarter campaign which wraps up at noon (Mountain Time) on Saturday, July 18. “Beyond that, I haven’t made firm plans about when and where BTC will be available,” says Tracy. For those wanting either the Colour Basics Deck or the 216 BreakThroughColour Deck, the first and fastest place to obtain them is via Kickstarter. BTC looks like a great way to improve your color confidence. Read more about Tracy and other Cutting Edge products on Facebook. Hi Cynthia. Thank you so much for featuring BreakThroughColour on PCD. It’s been a long time coming (my Colour Cards first debuted at the IPCA Synergy3 Conference in Atlanta in 2013), and yet I can’t believe the Kickstarter project is almost halfway done. The polymer clay community is already such a colour savvy bunch, I can’t wait to see how my system, as both an in-depth learning resource and a versatile design tool, will help people take their colour-full work even further.